7 Kids and Us: Airwick Freshmatic For a Great Smelling Home! Because I have boys, we have a lot of stink in our house. It's nothing new, I am used to it, but I always wonder when I have people over if they smell the stink too, or if I have done a good job masking it. I love the new Airwick Freshmatic Automatic Spray Device! You just put the batteries in, and the scent can of your choice, choose how strong you want the spray to be released and place it at least 6 feet up, and boom, beautiful scents released all day to keep your home smelling fresh! 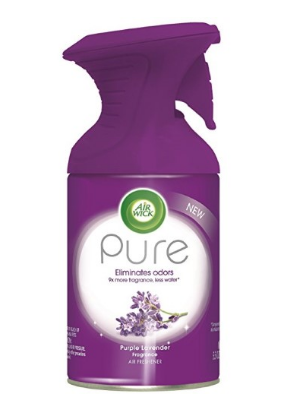 The Air Wick Freshmatic® automatic spray device has a sleek new look homeowners can be proud to display and Pure air freshener aerosol formula delivers 9 times more fragrance with less water compared to traditional Air Wick 8 oz. aerosols. The Freshmatic® auto spray device delivers continuous timed bursts of fragrance creating that pleasurable first whiff experience every time. The new design also features a "twist and lock" mechanism for easy refills and an angled refill nozzle delivers an improved spray angle that creates a wider dispersion area and a larger travel distance in any room. Air Wick Pure, available in Freshmatic® and as an aerosol spray, helps solve the problem of wet residue on upholstery, wood and other surfaces. 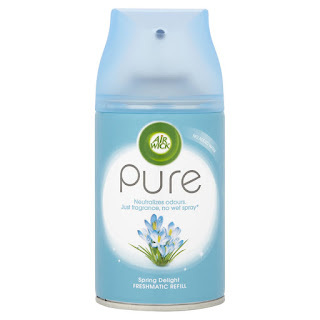 Formulated with less water, Air Wick Pure keeps homes dry and fresh. The Air Wick Freshmatic® device is available in black and beige, and is available now at most retailers as a starter set with a fragrance insert for $8 while fragrance refills retail for $4.88 each. I definitely recommend checking this out, for the price, I love that I can walk in my door and not worry about what random "boy" smell I am going to be exposed to! Also new, are some limited edition scent refills for the Airwick Freshmatic! I got to try Happy, and Love...and I can tell you, they are both awesome!